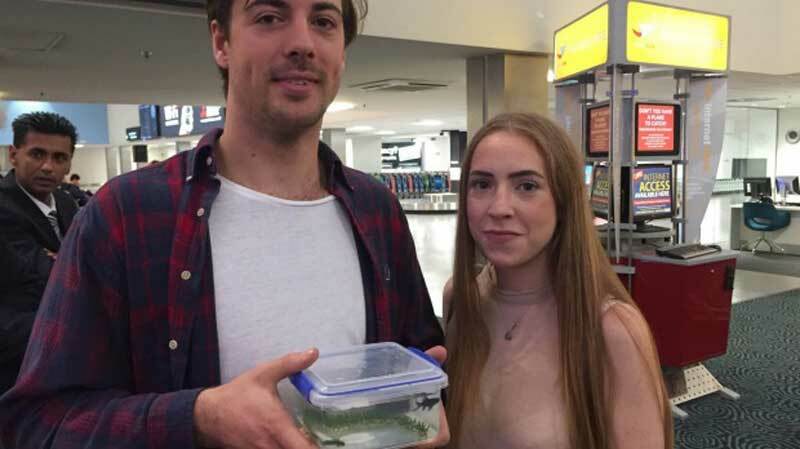 A little fish in a tupperware container was given marching orders off a Jetstar flight mid-taxi in Wellington, New Zealand. The pet's owner and passengers who overheard the exchange said he was initially told little "Lil' b" was welcome aboard. 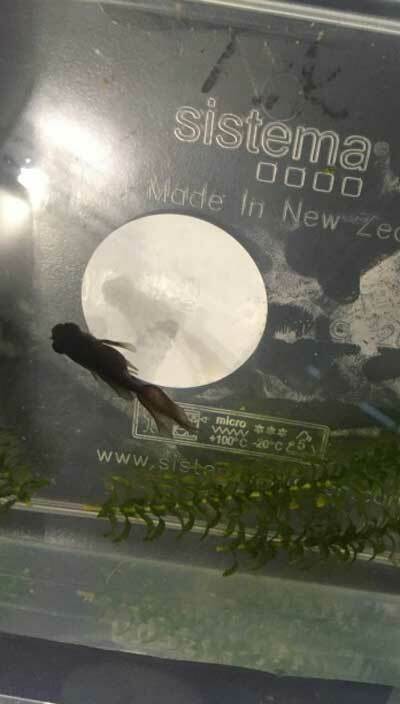 James Ayr's plan to give the two-month old black moor goldfish to his girlfriend was foiled when the flight attendant on the Thursday morning flight from Wellington to Auckland kicked the fish off. Passengers say the whole debacle ran the flight's arrival time late by 40 minutes when the plane had to turn back so the Wellington student could take the fish off the flight. Another passenger said he overheard Ayr being told during check-in that the the goldfish was welcome to travel with him. Ayr, who has 20 fish at home, said his tank was growing crowded and he had decided to surprise his girlfriend in Auckland with Lil' b for her birthday on Thursday, which he was flying up for. So he researched and concluded Lil' b would be safe in the container for the journey north. Ayr said he showed the fish to Jetstar staff when he checked in and presented his boarding pass. He said they rang the flight deck, got approval and he and Lil' b boarded. "He was happy, he was on the plane. I had him sitting in my lap." Then a Jetstar flight attendant approached Ayr. 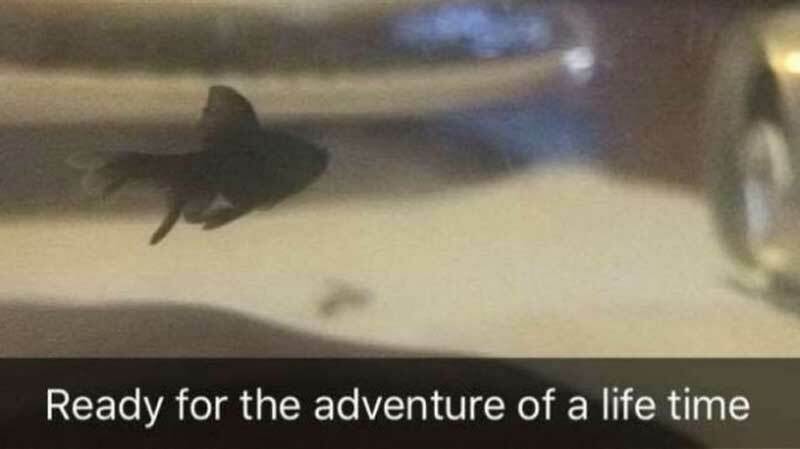 "They came up to me and said, 'do you have a fish?' I said 'yes I do.' " The attendant then told him Jetstar's policy was not to transport goldfish and it would have to be left behind in Wellington. The flight was stopped mid-taxi and turned around back to the terminal so Ayr and Lil' B could disembark. The flight, JQ252, remained on the tarmac with all other passengers waiting while Ayr tried to figured out what to do with the fish. Ayr was unimpressed. "I said, 'well, what am I supposed to do with it?' "
Ayr said the duty manager at Wellington Airport offered to take Lil' b home to his fish-tank, which he gladly accepted. A Jetstar spokesman said the aircraft left the gate ten minutes after schedule but returned to offload Li'l b and arrived in Auckland around 35 minutes late. "We know Li'l b doesn't take up much room, but live animals are not able to be carried on Jetstar flights, either domestically or internationally." The carrier's online policy says it reserves the right to refuse carriage of live animals. However, Lil' b later arrived in Auckland safe and sound. Air New Zealand allowed Lil' b to fly and it was all smiles and relief as the fish was eventually reunited with Ayr and his girlfriend Edith Scott. "It's been a roller coaster of emotions today," Ayr said.